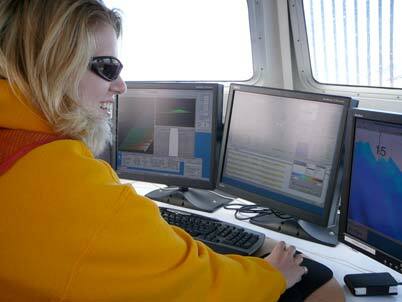 Emily pulls in the CTD. The morning began at 7:00 with a delicious breakfast to fuel me up for what lie ahead. I was on the POD (plan of the day) to go out on a small launch boat. How exciting! My only hesitation was knowing that I would be out on a small boat for 8 hours and I might just have to pee! Regardless of my worriers, shortly after the 8:00 safety briefing, Launch 1010 was put in the water and myself, ENS Jonathan French, and boatmen Emily Evans and Ron Walker boarded with our gear for the day! 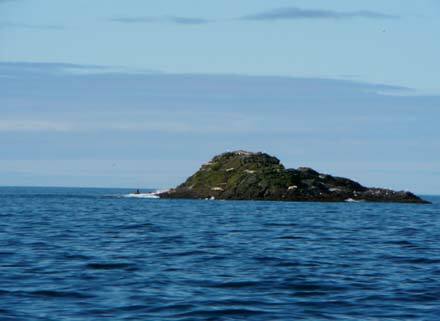 We headed south of Andronica Island, where the FAIRWEATHER had been anchored for the night, and began our hydrography work. Each launch is equipped with the same technology that the FARIWEATHER has, making it easy to collect more data at one time. As we located the polygon where we were assigned to work, we dropped the CTD (conductivity, temperature, depth) device into the water. 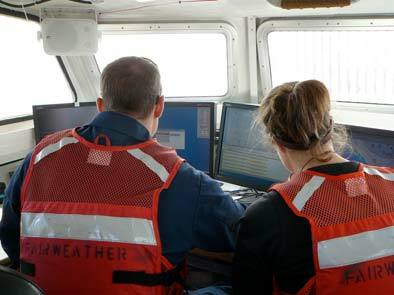 Jon and Emily quickly processed the data and then we began making passes through the polygon collecting data from the bottom of the ocean using the MBES (multi beam echo sounder) that is located on the underside of the boat. This equipment provides a picture of what the ocean floor looks like and locates any features such as rocks and rough terrain by bouncing beams of sound to the bottom of the ocean floor and then receiving them back. The speed at which the beams return and the length at which they travel is combined with the data that is collected from the CTD to get an accurate representation of the surface of the ocean bottom. I was able to run the equipment for a short time as Jon looked over my shoulder. It was not too difficult! I was excited to learn later that night, after our work was processed that we collected very clean data that they survey team was very happy with! Good work team! I could not believe how absolutely gorgeous it was in Alaska today! The skies were clear, the wind was calm and the temperature was warmer than it has been since arriving here! I even got to sunbathe on the launch for a short while as we cruised back to the FAIRWEATHER at the end of our workday. I got to see lots of wildlife on the launch and on Andronica Island. While surveying today and yesterday we had to travel at precise speeds to acquire the most accurate data. While on Launch 1010 today we surveyed at 8 knots, completed our roll test at 7 knots, and yesterday while surveying on the FAIRWEATHER we cruised at 10 knots. Convert each of these speeds to miles per hour to get a better idea of how fast were we moving through the water in each instance. Stellar Sea Lions sun on a small island southwest of Andronica Island. 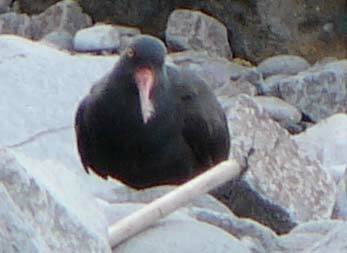 A black oystercatcher comes close to our campfire on Andronica Island. We were invading his habitat. 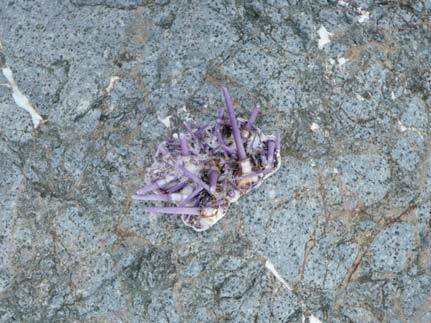 The remains of a sea urchin were washed up on the beach of Andronica Island. 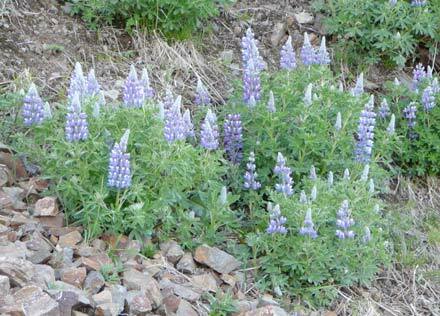 Lupine, a beautiful purple flower, grew wild all over the banks of Andronica Island. 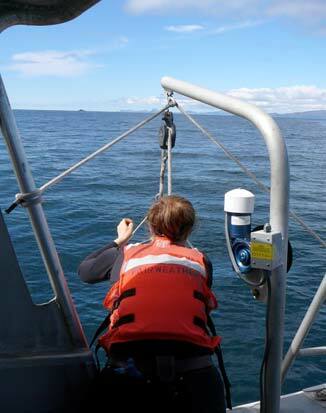 This entry was posted in 2006, Lisa Kercher, NOAA Ocean Service, NOAA Teacher at Sea and tagged Alaska, CTD, data analysis, fisheries, Hydrographic survey, navigation, NOAA Ship Fairweather, sea lion, seabirds, sonar. Bookmark the permalink.